Industrial, conch, belly button, tragus and more! With all the inventive body jewelry and body piercings available, the standard metal barbell design does not satisfy everyone’s needs. The body jewelry industry has begun to respond with more creative and innovative designs including BioFlex body jewelry, studs, posts, chains, dangling, rings, among others. But what’s a person to do if her problem is not inadequate design but rather inadequate sizes? Never fear! Options are beginning to surface for those with not-your-average piercings who need not-your-average body jewelry. For example, several manufacturers offer a “pregnancy belly button ring” that is made of a flexible material that can be cut to size, and then self-threads. This type of belly button ring can be used other places as well. Say, a super wide industrial or a super short belly piercing. 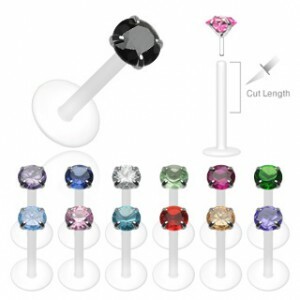 The same can be said for a style of post earring designed initially for labret and monroe piercings. This ring has a similar advantage in that it can be cut to any size. It’d be idea for a conch piercing or someone who wants a very short lip ring.